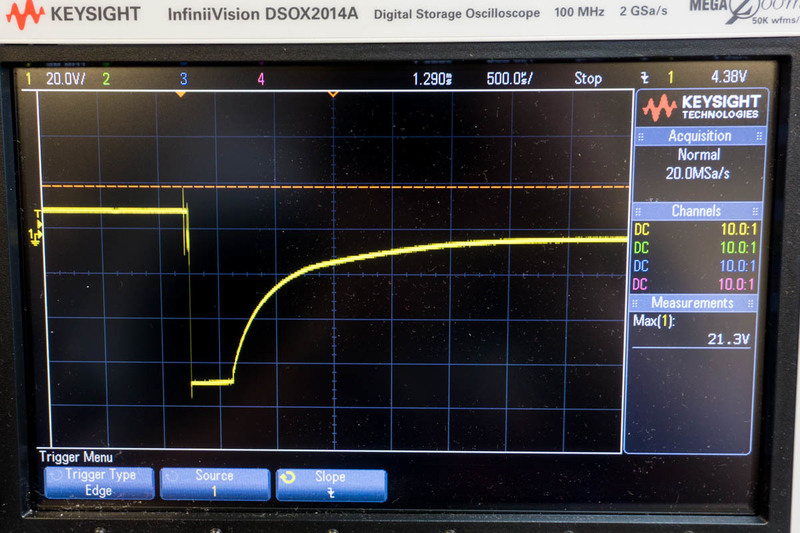 A friend of mine was asking about circuit protection for his FETs with an inductive load on it (a solenoid in this case), and was thinking that a TVS diode was better than a Schottky for the case. 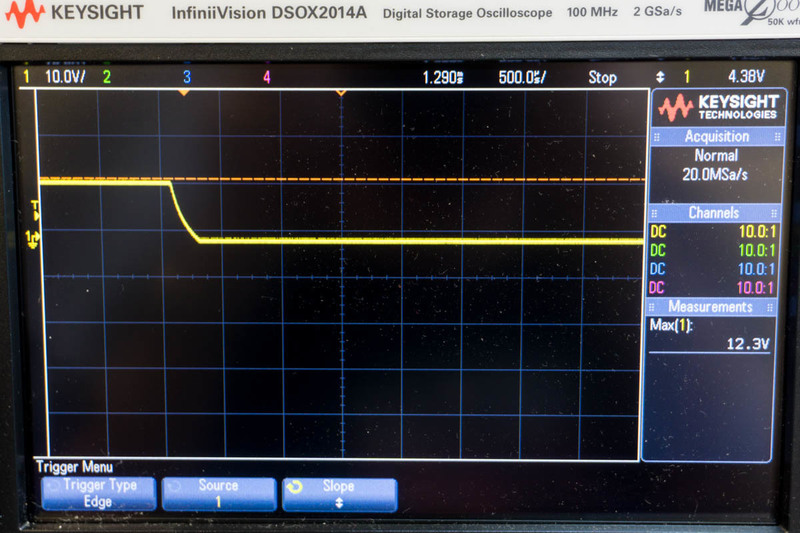 Sure, when a TVS diode sees something over a certain voltage, it clamps that down hard and it wont go much above the clamping voltage the diode is rated to - sounds pretty good... but I've always used schottky's as my primary protection for this particular scenario (a solenoid going open circuit with one leg still connected to your circuit). In order to prove my case, I made a little board with the V-One to put some diodes on, some with caps, some without to show how it worked in the real world. Solenoids are found in many real-world devices in the form of relays, water/gas switches, door latch activators and such. Any time you have an electromagnetic field and you take away the circuit, it collapses and the field's energy has to go somewhere, usually a big voltage spike. Motors do exactly the same thing. The test board has a bidirectional 20v TVS diode (its all I had in the parts bin), a 20V Schottky, and a 40V Schottky. One side had caps (0.1uf for the tvs, 1uf for the 40v, 10uf for the 20v), the other side did not. 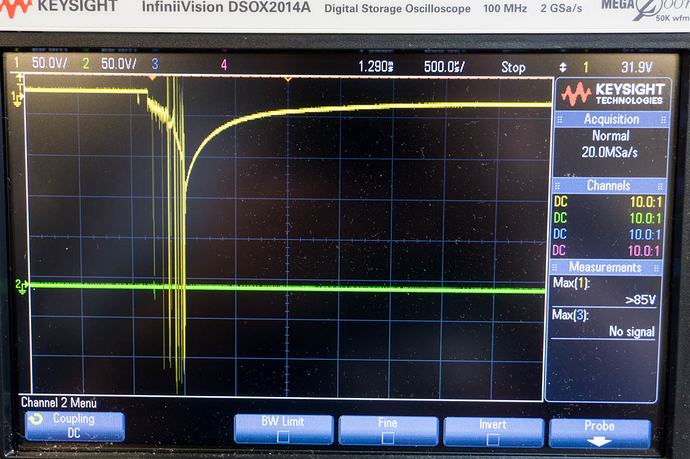 First up, no protection... this is what happens when the small solenoid has no protection, you max out the scope with >300v p-p spike for about 500us. Next victim, the TVS diode. It clamps the voltage very nicely to 20v. With the 0.1uF cap decoupling the solenoid the little "buzz" at the start goes away and it becomes a straight line. 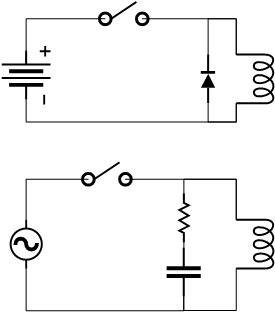 Both Schottky diodes are the same. 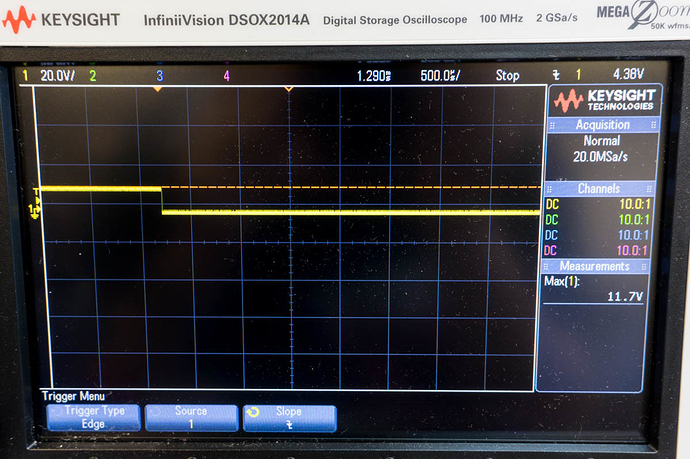 Just a square edge from the 12V drive to ground... no fuss, no broken fets. The 10uF cap on the Schottky, nice little bleed down of the voltage. Just for completeness - Do you think you could post a screen cap of the schematic? (I know it's trivial) How were you disconnecting the solenoid from the circuit, just tapping wires together or did you have an actual switch/pushbutton? 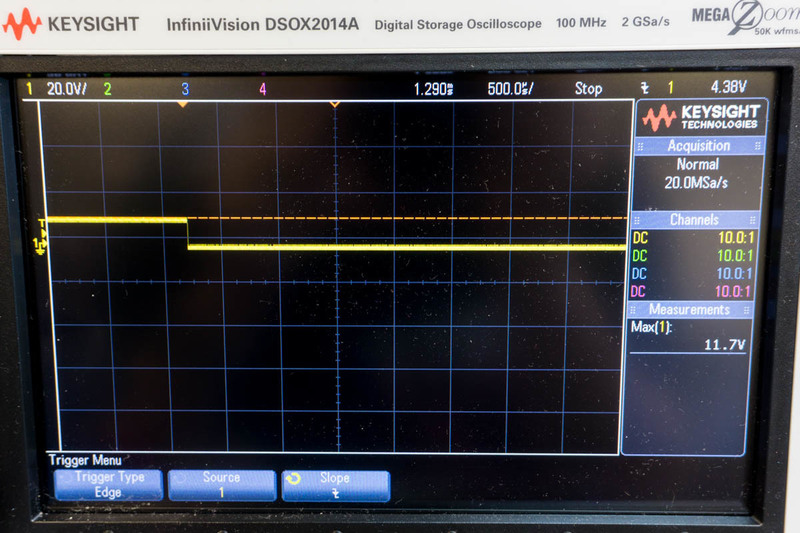 ^ Image shows up weirdly on my screen after posting - Click it to see both circuits. For these tests I'm pulling the load (12V) wire off, but the circuit performs exactly the same if you pull the ground wire - ie P-CH vs N-CH FET. I am a bit surprised at your circuit. Typically for DC you put a reverse biased diode around the coil to quench back EMF. For AC you use a Quench-Arc (I guess a TVS would also work for this). However AC mains rated Quench-Arcs (resistor capacitor pair) are readily available. I also wouldn’t trust that you have really eliminated the transient with that cap. It might no longer show up on your scope trace, but due to lead inductance in the cap, I very much doubt if it got rid of all of the high frequency components of the spike. The point to suppressing turn off spikes in a coil is to provide a way for the back EMF to discharge locally (without radiating RF in your wiring). The best place to do this is right at the coil itself. That is why many relay coils intended for DC include a diode in the relay coil itself. Remember the key characteristics of reactive components (caps and inductors). You can’t instantaneously change the current flowing through a coil or the voltage on a cap. 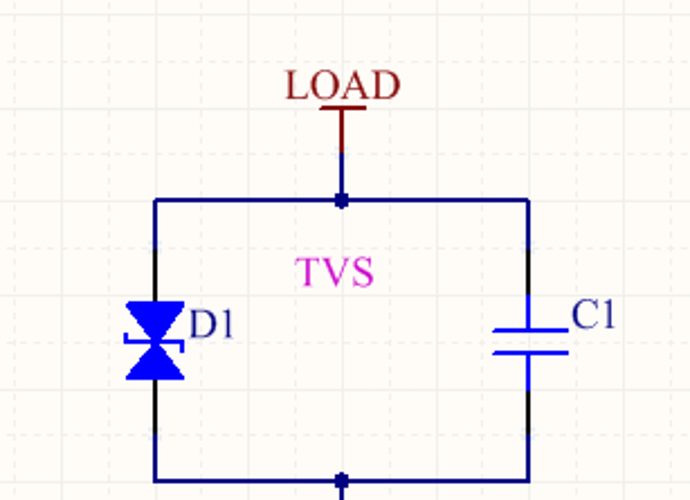 When you interrupt the current flowing though a coil it will generate however much voltage is required to keep that current flowing even after the switch is open. This is how an ignition coil generates 40 KV from 12VDC. By giving that current a path to flow (through the diode), the back emf is never generated in the first place. This is much better than trying to clamp spikes with a TVS.